Anne Bray has been working at the intersection of public space and media art as a hybrid artist and director of the nonprofit media arts organization, Freewaves. The creativity of one and the social outreach of the other have continuously fed each other. Engagement with edgy, demanding, clarifying art by a broad public is Bray’s mission. She connects challenging art with venues that offer the visibility, resources and energy for prominent display with an involved viewership. She is a visual instigator and translator. Her specialty is finding platforms for pressing and compelling subjects to be broached from various angles in different media. She exhibits that work in formats that publics, often unaware of contemporary art, can comprehend without the work losing its integrity. In her art, like in her career, she contrasts different points of view side by side. Viewers are asked to examine themselves. Questions are often the format. 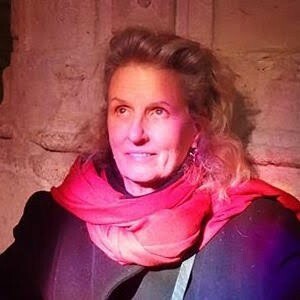 Her artistic process expanded in 1989 when with representatives of other art groups, she co-founded Freewaves, a grassroots yet global arts organization dedicated to collecting and connecting innovative and culturally relevant independent new media from around the world (see www.freewaves.org). Eleven biennial festivals presenting more than 3000 artists with the partnership of 125 curators and 100+ organizations have been held at Los Angeles’ Museum of Contemporary Art, Getty Center, Hammer Museum, on Hollywood and Chinatown streets, and have been supported by National Endowment for the Arts, MacArthur, Rockefeller, Rauschenberg and Warhol Foundations. Freewaves’ 21st anniversary was celebrated at Los Angeles County Museum of Art in 2010 with an exhibition and a launch of a book, DVD and new web archive. Recently she has been showing artists videos on Metro buses and projecting poems at public events. Video projection is her chosen medium. Her work spectacularizes still unresolved conflicts about the vulnerable. She exhibits installation/performances of video, audio, flat and 3-d screens at traditional and nontraditional venues including museums, galleries, gas stations, malls, movie theaters, and department stores, as well as on TV and billboards. She has produced public art projects with GLOW art festival in Santa Monica, Public Art Fund, NY Avant Garde Festival, LACE, CRA, Cinematexas among others, and multi-media installations at Santa Monica Museum of Art, Track 16, Pomona Museum of Art, MIT, Images du Futur in Montreal as well as Armory Center for the Arts, Foundation for Art Resources, Side Street Projects, Highways, NewTown, Civitella Ranieri, Santa Barbara Contemporary Arts Forum, First Night Celebration, SkyArt Festival, University Art Museum at CSU Long Beach, Otis Art Gallery, 6th International Triennial of Art & Ecology at Umetostna Gallery, L.A. Municipal Art Gallery, Cité des Arts et Nouvelles Technologies de Montreal, Banff Center, Pacific Film Archive, Artist Space, Hayden Gallery at M.I.T. and other experimental spaces.